Scholarly studies consider Paul's views on leadership tend to fall into one of three camps: 1) the historical development view, which in large measure identifies developments in church practice with developments in Pauline and deutero-Pauline ecclesiology; 2) the synchronic, historical reconstruction, typically making use of Graeco-Roman, social context sources, or social-scientific modelling, focusing on a single congregation, and sometimes distinguishing between the situation to which Paul was responding and the pattern he sought to impose; and 3) the theological/hermeneutical analysis, identifying Paul's particular approach to power and authority, often independently of any detailed reconstruction of the situations to which Paul was responding. Andrew Clarke has explored in an earlier work, Serve the Community of the Church (Eerdmans, 2000), the distinctive, local and historical situations in the various Pauline communities and concluded that there is no evidence that they organised themselves according to a common set of governmental structures which clearly developed with the passage of time. Rather each community was influenced by its own localized, social and cultural context. The present project builds on this, and necessarily focuses on leadership style rather than church order. 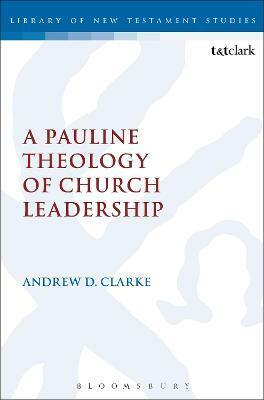 It seeks to recover from Paul's critical responses, his generic ethos of church leadership, including the ideal qualities, characteristics and task of leaders and the nature of appropriate interaction and engagement with church members. In the light of current, theoretical discussions about power and gender, the study focuses particularly on Paul's attitude towards hierarchy, egalitarianism, authority, responsibility and privilege. Andrew Clarke is Senior Lecturer in New Testament at the University of Aberdeen. His other books include: Secular and Christian Leadership in Corinth: A Socio-Historical and Exegetical Study of 1 Corinthians 1-6 (1993), and Serve the Community of the Church: Christians as Leaders and Ministers (2000).